Make these basic recipes your own! Combine flours, soda and salt. Using an electric mixer combine sugar and oil, beat at medium speed for 2 minutes. Add egg, beat till light and lemon-colored. On low speed, add flour and banana, alternating; blend well after each addition. Coat loaf pan (8 x 4) lightly with oil or cooking spray. Bake 350 degrees for 45 minutes (test with skewer or toothpick). Wipe 8 x 5 loaf pan with a little oil; dust with 1 tbsp. flour. Combine bananas, brown sugar, egg, oil, milk and vanilla, mix until lump-free with electric mixer on medium speed. Pour banana mixture into flour mixture, stir till combined. Bake at 350 for 55-60 minutes (test with skewer or toothpick). *To toast almonds, spread on rimmed baking sheet, bake at 350, checking frequently minutes and shaking pan slightly to turn nuts over. 10-12 min. total (watch that they don't burn). Banana bread lends itself well to additions and modifications. The two recipes above improve nutrition and fiber content by adding whole wheat flour. One-quarter cup of any flour used in banana bread can be replaced with oat bran. While nutritionally brown and white sugar are the same, flavor will change, depending on which one you use; white sugar, light brown sugar, and dark brown sugar all produce slightly different tastes. Experiment. Oil can be replaced by an equal amount of melted margarine or butter. One-half the quantity of mashed banana can be replaced with an equal amount of drained crushed pineapple. Other flavor changes: add grated orange or lemon peel (1-2 Tbsp.) and a squeeze of juice (from � orange or both halves of a lemon). Almond extract instead of vanilla, a grating of nutmeg or � teaspoon powdered ginger all produce delicious results. Up to �-cup of raisins, chopped walnuts or pecans, sweetened dried cranberries, dried cherries or blueberries, miniature chocolate chips, shredded coconut, or sunflower seeds can be added without affecting the density or rising ability of the loaf. Two additions will produce a slightly denser, lower-rising bread and may need a few more minutes in the oven to finish. 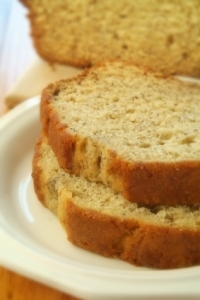 The problem with banana bread is not what you might add�it's figuring out when to stop adding! Banana bread recipes also make great muffins. Place foil or paper baking cups in a 12-cup muffin pan. Fill cups 2/3 full of banana bread batter. Bake at 350 degrees 10-15 minutes (check both browning and moisture of muffin centers with a skewer or toothpick after 10 minutes). Makes 8-10 muffins. Banana bread, wrapped airtight, freezes well, as do banana bread muffins.